Editors note: Since this site’s inception, the volunteers at TALON have felt that our purpose is not to catalog the past, but to inform the present. We do not exist as activist nostalgia, but to guide new generations by sharing information about the errors and victories of those who came before them. Our hope was always that modern campaigns would be built with these lessons, and that we could share their own errors and victories as a long term effort to refine our movement’s tactics and strategies. 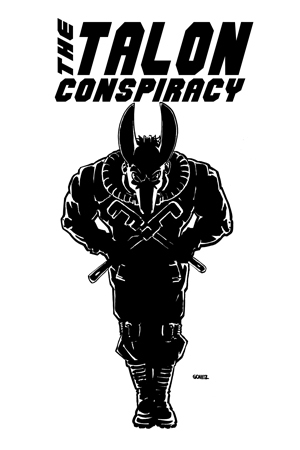 The TALON Conspirator posts will highlight our favorite organizations and the facets of our shared history that inspire them. Our fifth post in this series is written by volunteers from the Vancouver Animal Defense League. Since 2008, the Vancouver Animal Defense League (VADL) has been undertaking ongoing grassroots campaigns that, in our view, are advancing the cause of animal liberation. I’d like to share updates on three particular recent campaigns, and how we believe they advocate for animals effectively. In the interest of fashion, the outdoors-wear company Canada Goose has activated trappers to torture and slaughter millions of coyotes over time, so that canine skins can decorate the tragically iconic Canada Goose jacket. The coyotes are seized in leghold traps, whose steel jaws crush down upon the animals’ limbs, slicing through flesh and clamping on bone. Coyotes desperate to escape this agony will often try to wrench or chew off their foot. If they do not “succeed” in self-amputating, the animals languish for hours or days, until trappers shoot, beat or stomp the coyotes to death. This is why in 2013 the VADL launched a campaign to pressure 14 known Canada Goose retailers in Vancouver to drop Canada Goose fur-trimmed jackets and accessories. Typically, our campaigns employ two fundamental tactics: weekly or greater frequency, and high-volume chanting (without use of megaphones). We also employ email and phone saturation campaigns, and leveraging stores via lobbying their landlords, among other tactics. Broadly, our strategy is to leverage every victory toward influencing ensuing targets. To date, 2 of the 14–Hills of Kerrisdale and Grouse Mountain Outfitters–have terminated retailing of Canada Goose fur products following VADL campaigning. These were the first two stores in Canada to drop Canada Goose following animal rights campaigning. Target 3 is Brooklyn Clothing, a high-end menswear boutique in Vancouver’s affluent Yaletown neighbourhood. We began weekly protesting in November 2013, and during busier retailing periods have escalated to twice weekly. Store owner Jason Overbo is fighting back, including an obnoxious “anti-bullying” campaign that strives to cast the store as victim and we as villains. We remain oblivious to any public sentiment that buys into this manipulation, and persist in full-throttle chanting that has elicited hundreds of complaints and a media blitz that largely sympathized with the store and neglected any mention of animal suffering. Ironically, we believe this villainizing of the VADL only empowers our work for animals, as ensuing targets will be more fully aware of our disruptive tactics and so may be more swiftly leveraged. This fall we will escalate our campaign at Brooklyn via secondary targets. 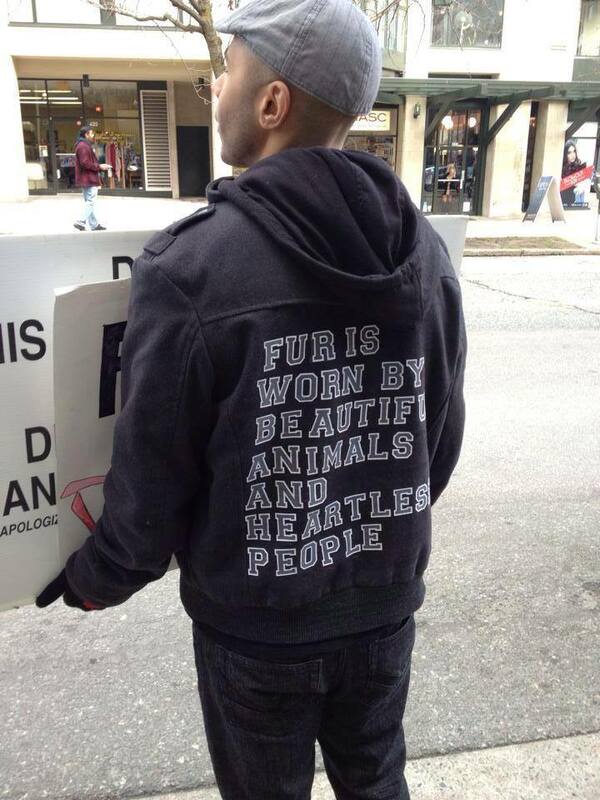 The VADL is committed to continuing its campaign until Jason Overbo announces termination of fur retailing. 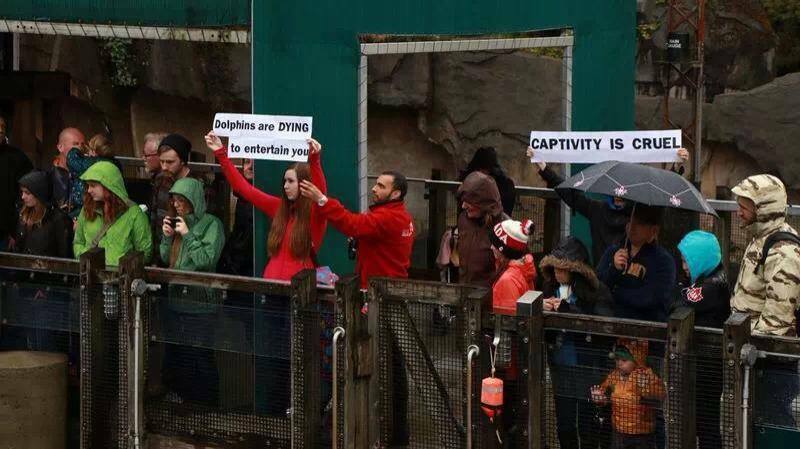 The Vancouver Aquarium (VanAqua) imprisons a range of marine animals, including dolphins and beluga whales. But unlike other marine prisons, VanAqua is situated on municipal park property, and so the Vancouver Park Board holds their lease and regulates whether VanAqua continues breeding and importing cetaceans. Intervention by the Board on the cetaceans’ behalf is presently vital, as VanAqua is only months away from starting a multi-million dollar expansion of their whale and dolphin pools, which would enable them to incarcerate more belugas and dolphins. This is why numerous local organizations, including the VADL, have coalesced to pressure the Park Board and aquarium. The VADL strategy within this campaign focuses, in significant part, on striving to generate media coverage with protest actions that are designed to be timely and captivating. One example is our staggered unfurling of posters by activists posing as patrons inside the facility. The coalition’s overall campaign has garnered international, animal-sympathetic media attention, consequently increasing pressure on the Board. Depending on who forms the Oversight Committee and whether they are given the authority to refuse the importation of cetaceans from other facilities, this transformation could result in a phase-out of cetacean captivity at the Vancouver Aquarium without referring to it as such. Meanwhile, the coalition’s campaign continues. The Calgary Stampede is one of North America’s largest rodeos, attracting over a million tourists to Calgary annually. Within this vast animal-abuse-fest, the chuckwagon races (“invented” at the Stampede almost a century ago) are the deadliest for animals. In this sordid spectacle, each race comprises several wagons pulled by four thoroughbred racehorses apiece in front of several mostly inebriated spectators, racing at breakneck speed. In the past 28 years, this madness has led to 63 horses being killed, including horses every year for the last decade. The horses usually die from shattered limbs or hemorrhaged blood vessels in the lungs, kidneys or heart, as a result of spectacular crashes and cardiovascular stress. As result of this widely publicized carnage, the races have suffered declining public support and are thus a vulnerable target for activism. 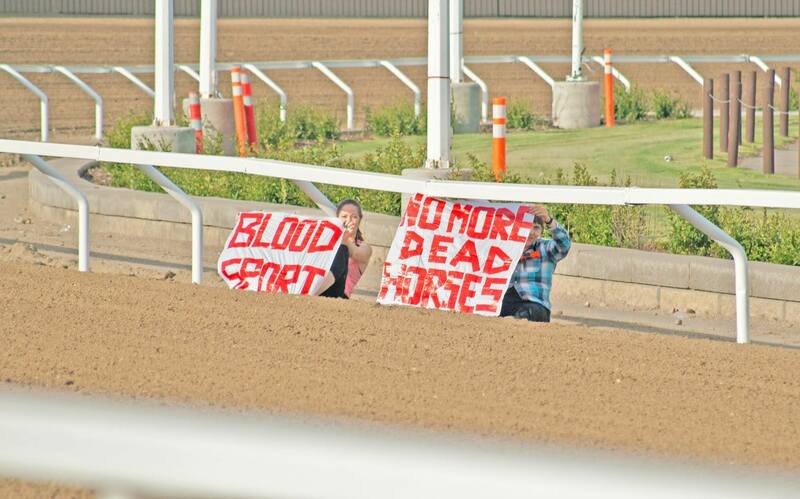 On July 4, 2014, two VADL activists locked down on the inside railing of the chuckwagon track before the inaugural race was set to begin. Marley Daviduk and Samantha Baskerville infiltrated the track 30 minutes before the races, and locked their necks to the railing using kryptonite u-locks. It took authorities an hour to remove Marley and Sam, and by that point the lockdown had already made headlines due to the coordinated action of the VADL support crew, which was immediately forwarding pictures and video to media. By the next morning, the event had garnered national media coverage, with VADL spokespeople hammering home the high horse-mortality numbers and calling for termination of this annual bloodbath. Following this action, the VADL has initiated a pressure campaign vs. GMC Canada, sponsor of the chuckwagon races. Initially we are undertaking a telephone pressure effort, and are developing further tactics. Marley and Sam were taken into custody, questioned and released, on a promise to appear in court on August 20. The Vancouver Animal Defense League will continue defending animals via campaigns that are sustained and pressuring, which we consider a proven formula to advance animal liberation and liberate animals. Thank you for taking time to know more about our efforts, and we hope you’ll join our Facebook page and community. And thank you so much, TALON, for this opportunity and forum.